For the subway station, see Downsview Park station. Downsview Park (French: Parc Downsview) is a large urban park located in the Downsview neighborhood in the North York district of Toronto, Ontario, Canada. The park's name is officially bilingual due to it being federally owned and managed, and was first home to de Havilland Canada, an aircraft manufacturer, and later was a Canadian Forces base. The park still contains Downsview Airport. In 1999, the Government of Canada declared it as "Canada's first urban national park." However, unlike the Rouge National Urban Park in eastern Toronto, Downsview Park is managed by the federal Crown corporation Canada Lands Company rather than Parks Canada. As of 2017[update], little development has taken place, and the park remains mostly untouched. Before the establishment of the aircraft plant and airfield the site was farmland that emerged after John Perkins Bull settled nearby in 1842. The area was first used in 1929 by de Havilland Canada, where it housed the company's Canadian operations. The manufacturing plant was used to make aircraft during World War II. After the war, the Department of National Defence (Canada) needed space to station Royal Canadian Air Force squadrons in the area. In 1947, the federal government acquired and consolidated 270 properties in Downsview surrounding the manufacturing plant. In 1999, the federal government announced, to great fanfare, that the park would become "Canada's first urban national park." Downsview Park announced an International Design Competition. In 2000, Bruce Mau and Rem Koolhaas submitted the winning design scheme, known as "Tree City." In the years that followed, little development took place, and the plans fell into dormancy. Instead of creating a park made up of almost entirely green space as called for in the "Tree City" plan, Parc Downsview Park Inc., the crown corporation then in control of the park, approved constructing commercial and residential developments across the north, east and southwest ends of the park. The initial phase of the construction of Downsview Park began in 2005. The first step was to regenerate the soil, which had been compacted by more than 50 years of military base use, so that it will again support the lush vegetation that is planned for a very significant portion of the site. A major feature of this initial work was the development of the Canada Forest, which was started with a partnership with Natural Resources Canada and its 2020 Fast Forest initiative. In 2013, Mattamy Homes, Canada's largest homebuilder, entered into a joint partnership with Urbancorp, a real estate developer to begin construction on the first residential community in the park. Local councillor Maria Augimeri said that the development was unlikely to appease angry residents who had expected a park to be developed on the land. In 2014, the City of Toronto once again attempted to acquire control of the park. The federal government rejected the proposal, saying it would not consider transferring responsibility over the park to the city. The Toronto Star obtained a memo that indicating that the government did not want to consider transferring the park because of its immense value. The property has been the site of several high-profile events, including two Papal visits by Pope John Paul II, in 1984 (while still an active military base) and 2002 (World Youth Day), as well as the Molson Canadian Rocks for Toronto concert in 2003 featuring The Rolling Stones, AC/DC, and many others. The Canadian music festival Edgefest has also called Downsview Park home for the last two years[when?] with Linkin Park, Stone Temple Pilots, The Sam Roberts Band, Billy Talent, AFI, Alexisonfire and Metric performing. Edgefest returned to the park in 2011 and will be a featured event again in 2012. Since 2012 the Veld Music Festival has been held at the park. The Tragically Hip performed to a crowd of approximately 30,000 on Canada Day 2011. On 16 June 2012, a temporary stage collapsed an hour before gates opened for a scheduled Radiohead concert, killing one person and injuring three others. In 2012, the Junior Caribana festival was moved to the park. An aerial view of the runway of the Toronto/Downsview Airport at Downsview Park. 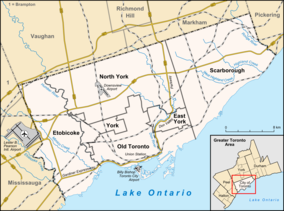 Downsview Park consists of 231.5 hectares (572 acres) of land in the northwest portion of the City of Toronto and the geographic centre of the Greater Toronto Area. These lands were originally home to de Havilland Aircraft of Canada (1929–1947) and then as the air force base CFB Downsview from 1947 until April 1, 1996, when the base closed. It was also announced that the lands were to be held in perpetuity and in trust as a "unique urban recreational green space for the enjoyment of future generations." The mandate to create the urban recreational green space was given to Parc Downsview Park Inc. (PDP) in 1996 and the title to 231.5 hectares (572 acres) of the Downsview Lands was transferred to PDP in 2006 in order to facilitate the development of Downsview Park. The Department of National Defence (DND) retained 29 hectares (72 acres) of the land to accommodate ongoing military needs. Approximately 150 hectares (370 acres) of the land adjacent to the Downsview Lands (including Toronto’s oldest operational airport) is under the jurisdiction of Bombardier Aerospace. A rail line that is used mostly by GO Transit trains runs through the centre of the Park. 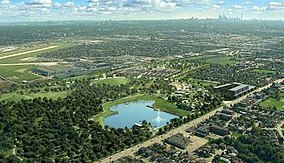 As the mandate for the park requires that it be developed on a self-financing basis, approximately 102 hectares (250 acres) are dedicated to opportunities that provide a revenue stream to finance the construction, development and management of Downsview Park as an integrated, sustainable community. The park features a large man-made pond on the Keele Street side. Although it is an artificial body of water, the water from it flows out to the Downsview Dells ravines and eventually into Black Creek. From 1996 to 2017, the closest Toronto subway station to Downsview Park was Downsview station, which served as a terminal station of Line 1 Yonge–University. Situated near the eastern edge of the park across from Downsview Airport, the station was renamed Sheppard West in advance of a northern extension of Line 1, which opened on December 17, 2017. Since 2008, bus route 101 operated by the Toronto Transit Commission (which also operates the subway) serves the grounds of Downsview Park directly, with daily service between Sheppard West station and the Aerospace Museum on Carl Hall Road. Downsview Park station opened on December 17, 2017, as part of the Line 1 subway extension into Vaughan. This station is located at the park's north end and is an intermodal interchange with the Barrie line, part of GO Transit's commuter rail services, whose station opened on December 30, 2017. The Downsview Park Sports Centre is a 45,000-square-metre (485,000-square-feet) multi-purpose facility, formerly an aircraft hangar for the de Havilland Aircraft Company and later the Canadian Forces. Downsview Park's most regular attraction is The Hangar, an indoor recreational facility within the Downsview Park Sports Centre, which accommodates approximately 600,000 visitors per year to its soccer, ball hockey and beach volleyball facilities alone. Winter 2011 saw the welcome addition of a domed field, expanding winter field availability. During the summer of 2009, Toronto Roller Derby started playing their home games at Downsview, using a space in the Downsview Park Sports Centre's west end. In the summer of 2011, Toronto Roller Derby moved to another space in the Park known as The Bunker, and hosted the inaugural Roller Derby World Cup in that space in early December 2011. The Downsview Park Sports Centre also accommodates Grand Prix Kartways indoor electric go-karting (aka green go-karting), the HoopDome basketball facility, The Rail Skatepark skateboard destination, True North Climbing indoor rock climbing gym and Premier Elite Athlete’s Collegiate (PEAC) school for elite athletes. The National Squash Academy, operated by former World #1 player Jonathon Power is a recent addition to the Sports Centre. In October 2013 an ice hockey arena was opened, and was renamed in February 2015 to Scotiabank Pond. Toronto FC's BMO Training Ground and Academy. In March 2011, Downsview Park was selected as the site of Toronto FC's new state-of-the-art Academy and Training Facility. Construction began on the KIA Training Ground in May 2011, and the facility opened in June 2012. It includes three grass fields, one domed turf field and a field house. Maple Leaf Sports & Entertainment (MLSE), owner of Toronto FC, spent more than $21 million building the facility and pays rent for the land, with an aim to becoming the epicentre of soccer development in Canada. In July 2014 it was announced that MLSE would expand the training grounds to house a practice facility for the Toronto Argonauts of the Canadian Football League, which would rent the facility from MLSE and practice on a nearby city owned field. The team moved in that September, but later moved their practice facility to Lamport Stadium in 2018. In 2018, BMO acquired the naming rights to the training ground, renaming it to the BMO Training Ground & Academy. With their drop to the division 3 USL League One for the 2019 season, Toronto FC II moved their home games to BMO Training Ground. Volleyball Canada made the Downsview Park Sports Centre their new headquarters and training facility in 2011. A new four-pad ice complex will be another welcome amenity scheduled to open in 2013. Operations at the Downsview Park Sports Centre generate funds to help build Downsview Park. The Downsview Park Sports Centre is growing to become the leading centre of athletic excellence in the Greater Toronto Area as the development of the Downsview Park sustainable community progresses. Downsview Park continues to pursue its vision to become a nationally recognized centre for sporting excellence and participation. Ryerson Rams soccer teams have been using the outdoor soccer field as their home field. Downsview Park is also home to the Toronto Wildlife Centre, the Downsview Park Film and Television Studios and the Downsview Park Arts Alliance, all of which not only pay rent to assist PDP in meeting its self-financing requirements, but also help to animate the site with a variety of programs and activities, many of which are run in partnership with PDP. A large warehouse known as the Supply Depot, located at 40 Carl Hall Road, is used as a farmer's market and movie studio, and Doors Open Toronto tours have been conducted there. In addition to lease based partners/tenants, Downsview Park plays host to a variety of other community partnership. There are urban agriculture groups actively producing food crops, a large collection of hives from a local bee hive association and ongoing community tree planting and environmental stewardship programs through groups like Evergreen. ^ a b c d Mendelson, Rachel (23 April 2014). "Feds say no to giving Downsview Park to Toronto". Toronto Star. Retrieved 9 September 2014. ^ a b c Hume, Christopher (22 March 2013). "Federal takeover of Downsview Park sends plan back to drawing board: Hume". Toronto Star. Retrieved 9 September 2014. ^ "Historic Downsview building slated for demolition". Canadian Press. CBC News. 29 October 2011. Retrieved 9 September 2014. ^ Grewal, San (May 25, 2010). "What's going on with 10 major projects around the GTA". The Star. Toronto. ^ a b Pigg, Susan (26 November 2013). "Mattamy to partner on Downsview Park redevelopment". Toronto Star. Retrieved 9 September 2014. ^ "Veld Music Festival". Retrieved 14 February 2017. ^ "Toronto stage collapse kills 1 before scheduled Radiohead concert". Msnbc. 16 June 2012. Archived from the original on 18 June 2012. ^ "1 dead as Radiohead stage collapses ahead of Toronto concert". CBC.ca. 16 June 2012. ^ "Caribbean Carnival: Toronto's Junior Carnival". The Toronto Star. 9 July 2012. ^ "ToRD - Venue". About. Toronto Roller Derby. Archived from the original on 7 November 2011. Retrieved 30 October 2011. ^ Casey, Liam (2 December 2011). "Canadian women send French flying 224-17 at Roller Derby World Cup". Toronto Star. Retrieved 20 January 2012. ^ "BUCKINGHAM SPORTS PROPERTIES COMPANY ANNOUNCES NEW STATE-OF-THE ART FOUR-PAD ARENA". Retrieved 14 February 2014. ^ "Scotiabank Pond Unveiled as Part of Scotiabank Hockey Day in Canada". Retrieved 14 February 2014. ^ Girard, Daniel (2011-10-12). "Video: TFC building permanent training facility at Downsview Park". Toronto Star. Retrieved 2014-01-03. ^ "About the facility". Toronto FC. Archived from the original on 2014-02-09. Retrieved 2014-01-01. ^ "Argos partner with MLSE to build new practice facility". Toronto Argonauts. 2014-07-24. Retrieved 2014-07-24. ^ Rubin, Josh (2014-07-25). "Argonauts, MLSE partner on new practice facility". Toronto Star. Retrieved 2014-07-25. ^ Zicarelli, Frank (2014-09-09). "New practice facility gives Argonauts some stability". Toronto Sun. Retrieved 2014-09-09. ^ Scianitti, Matthew (2014-09-04). "Argos' players, staff grow frustrated over work conditions". TSN. Retrieved 2014-09-10. ^ "Argonauts to relocate football-operations staff". The Sports Network. 2018-06-01. Retrieved 2018-06-01. ^ "BMO acquires naming rights to Toronto FC's Training Grounds, becomes Official Partner of Toronto FC Academy". Toronto FC. 2018-01-22. Retrieved 2018-02-27. ^ "Toronto FC II 2019 USL League One Regular Season Schedule Announced". Toronto FC. 2018-12-10. Retrieved 2019-01-06.